Industry City is a waterfront industrial complex in the Sunset Park neighborhood of Brooklyn that’s home to an eclectic mix of shops, restaurants, artisans, offices and warehouses. What was once a long time ago a manufacturing and shipping complex called Bush Terminal (no relation to the Bush political family), Industry City has seen a full scale renovation and modernization in the past six years at the hands of the same developers who turned the Nabisco Factory into what is now Chelsea Market. We didn’t know what to expect for our visit, particularly since Sunset Park is a bit past the parts of Brooklyn that have seen a huge influx of recent development. 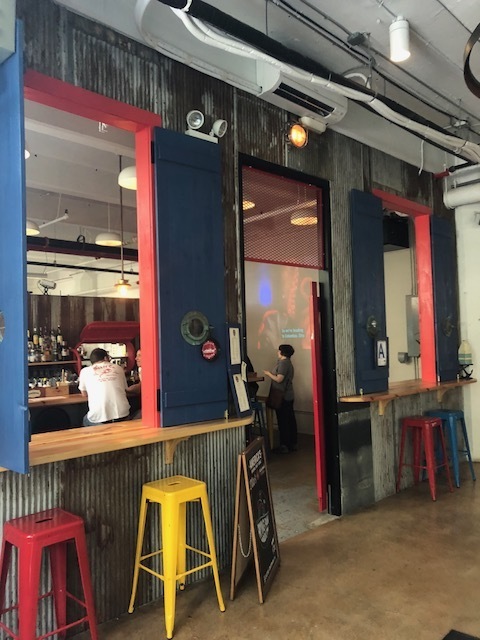 We were VERY pleasantly surprised - a summer Saturday spent at Industry City is a blast! Industry City seems to be making a big push to become a place where artists and creative folk mingle and showcase. The M.C. Escher Exhibit is currently there through February 2019 and recently, Industry City announced that teamLab, a Japanese art collective, will be setting up shop in August 2019 (!!) with a super cool looking immersive installation. A group called Collision Project has formed to encourage artists, even amateurs, to send ideas their way for possible viewing at Industry City. On our visit, we saw three of their currently featured projects, all located within the IC Food Hall: the gorgeous watercolor installation by Street Artist Drew Straker (a/k/a Straker, a/k/a Muralist) called Neon Elevator (seriously, follow him on Instagram!! ), a high tech looking piece called Infinite Tiles of Virtual Space by Gabriel Pulecio and the elegant Dragonfruit by Illustrator, Adriana Picker. 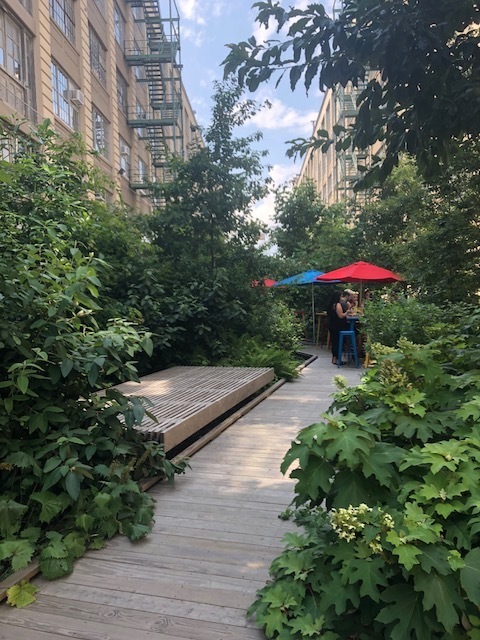 Just walking through the many buildings and courtyards of Industry City, you’ll stumble upon colorful murals and artistic displays, and in one rock garden space, we saw lovely statues by Artist Duo Adam Frezza and Terri Chiao that make up the Zen Garden. There are also many home design stories at Industry City, like ABC Carpets & Home, Mitchell Gold + Bob Williams and my personal love, Flavor Paper (as well as tech companies and manufacturing). The majority of Industry City’s food offerings are located in the Food Hall in Building 2. There was a time when food halls were special in NYC, but today, there are so many around the city that I would not recommend coming to Sunset Park just for this. Suffice to say, our lunch was tasty and satisfying - I opted for a cheeseburger at Burger Joint and the rest of my family tried out Taco Mix. The best part of the Food Hall (besides seeing the art I mentioned above), was purchasing drinks inside and being able to then walk around outside with them in the courtyards. There are not many opportunities to walk around outdoors with booze in NYC. Oh and the Food Hall also has an avocado bar, if you’re into that sort of thing. Stand alone eateries are also scattered around the complex. In Building 5 there is a dry land outpost of The Frying Pan, whose original location is on a lightship vessel docked in Chelsea. 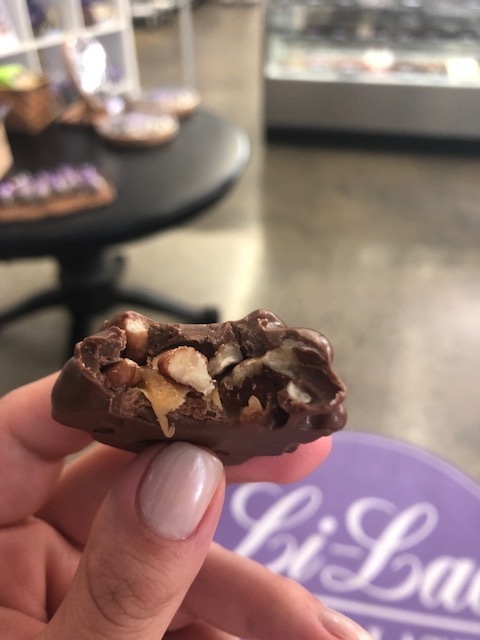 While walking from building to building, we spotted a Li-Lac Chocolates (Building 4), the Pickle Shack and Brooklyn Kura, a craft sake bar (both Building 5), Colson Patisserie (Building 3), and several other food and drink spots that appaer to be opening soon. A large Japanese food hall is also slated to open in Industry City this coming fall. The many buildings that make up Industry City are all interconnected through outdoor courtyard pathways. This may be brutal on a cold January day, but for our summer visit, it was an awesome way to explore the complex. Some of these courtyards provided serene city escapes. Others were busy with activity. One courtyard housed the Zen Garden mentioned above. Another courtyard I’ll discuss in more detail below. My girls loved running around the AstroTurf area between Buildings 5 and 6 - I noticed other families brought balls along to play here and some adults sans kids were relaxing for a nap on the AstroTurf. Jealousy! A Really Cheap Game Room! Hey parents! Industry City has a game room that costs just $5/person for unlimited games!! And my 4 year old wasn’t even charged the $5! The game room is not huge, but it has a few Pop A Shot and Skee Ball machines, some vintage arcade games like Ms. Pac-Man and some newer arcade games like Dance Dance Revolution. 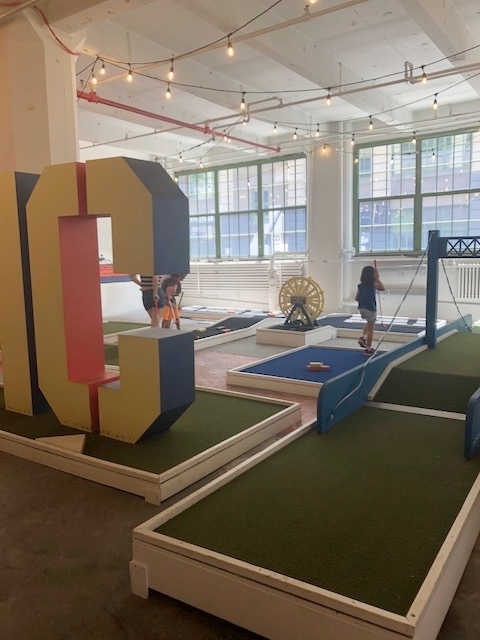 If electronic games aren’t your style, there’s also ping pong tables, shuffleboard and roughly 8 holes of (admittedly chaotic) mini golf. We didn’t stay too long because my little one was cranky and the A/C situation was lacking, but my older one had a blast and successfully played my husband in shuffleboard and did each hole of mini golf with me. Hooray! If I went again, I’d probably start my day here, since the game room just gets more crowded as hours pass. There are lots of events and performances at Industry City (check their website or follow along on social media), particularly on summer weekends. We visited on a Saturday and we got to see some cool Saturday specific things. Every Saturday, from 10am - 5pm, the Brooklyn Flea is at Industry City. For those who aren’t familiar, the Brooklyn Flea is a famous, giant flea market and antique fair that’s been happening in Brooklyn since 2008. We’ve been in the past, but we had a lot of fun this time, strolling through the vendors in the courtyard next to the Food Hall. Our favorite part was definitely rummaging through the vintage toys and knick knacks from dAN’s Parents House. 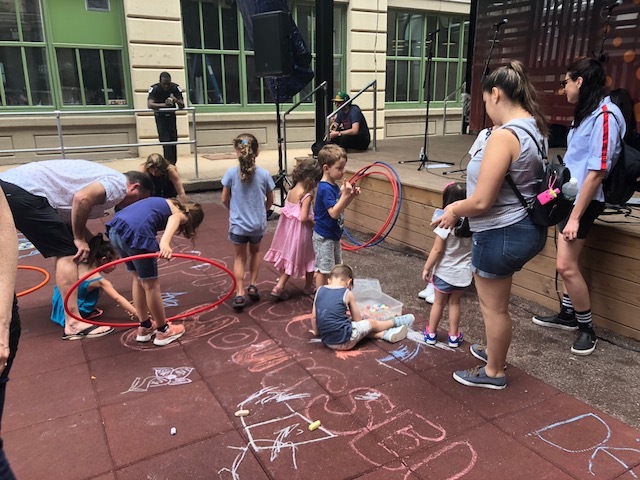 In the same courtyard on the Bell House Stage, every Wednesday at 5:30pm and Saturday at 12:30pm this summer, Rock and Roll Playhouse is putting on FREE kid friendly rock concerts. We happened to be there just as Black Tie Brass was about to start its set of New Orleans Sounds. The music was great and Rock and Roll Playhouse had out hula hoops, chalk and long colorful ribbons for the kids to dance with. Timing your visit with one of their shows is a very excellent move as a parent. And by the way, Rock and Roll Playhouse also puts on shows at Garcia’s at the Capitol Theater in Port Chester, albeit those shows are not free. The Bell House and City Farm Presents are putting on many adult friendly concerts and events on that same stage all summer and fall. More info here. Industry City is sadly pretty far from our house, but I’m so glad we checked it out. All four of us loved our visit so I know we’ll be back eventually!